An important ceremony Daily Stand Up can capture impediments of the active sprint. 1. Open Action menu from header. 3. An active sprint will be selected for the Stand Up meeting. 4. Select desire sprint if multiple sprints are active. 5. Start timer to act on the Stand Up Board.Log impediments for the active sprint. Scrum Board also gives system notification for the logged impediments. 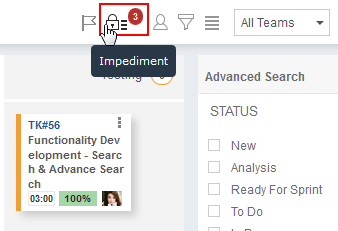 Click on impediments icon on Scrum Board to open the list of impediments logged during Stand Up ceremony. All the logged impediments can be viewed from the Scrum Board. Change the status of impediments to close, when the impediment is resolved. Click on View Impediments on header of Scrum Board to view impediments. A list of impediments will be displayed with its status, Owner and Due Date. Change Sprint or Team if require. Select Open or Close to view the impediments by its status.